“I stood in Venice, on the bridge of sighs. A Palace and a Prison in both hands”. In the air, on approach to land in Venice it’s hard to believe that these (sinking) islands can sustain such a bustling and influential city. The dream city that is famous on postcards around the world. Who decided to build a city on (floating) islands? They sit in such a way it looks as though one wave would engulf them all – and this plane was about to land on one, we hoped. Venice is a city of dreams, where imagination comes to life and is begging to be explored, I was so excited to finally, be arriving with my best friend to experience the whole thing and to begin our fleeting love affair with Italy. Other than the city itself, I was attracted to the city to visit one of my very good friends I met while travelling and volunteering in Nepal. I hadn’t seen her in years, but we had kept in touch (by writing gorgeous letters) and I had always promised one day I would be back – and here we were. We made our way from the Airport through the bustling streets and navigated the ‘water taxis’ over to our Hostel – The Generator Hostel on Zitelle Island, it was magical. The hostel itself was an old converted Mill and I’m pretty sure we walked past the entrance so many times before finally realising it was a hostel – so it was pretty tricky to find – but on entering it just blew you away. Very Gothic, wacky Venetian styled decorated and we were greeted with a yummy looking Delhi counter at check in – good sales move. We were travelling Italy on a budget – of some kinds – and we stayed in a Shared Dorm of 16 people. It was comfortable, you had as much privacy as could be expected. The only issue was deciding when the lights should be on and off – and of course those annoying bag rustlers who like to wake up at 6am. – But the hostel itself was beautiful, friendly, had a cheap bar and was on a beautiful island with fantastic views across the water. I mean, what more could you ask for? A lot of our time was spent sitting on the ‘Walk’ outside our hostel, feet dangling over the water, drinking beer and watching the world go by – and the giant cruise ships that came through this Canal – and soaking up the wonderful atmosphere of Venice. Once you sat back, you started to fully appreciate Venice completely. The city oozes romance, beauty, elegance and has such a relaxed and easy-going atmosphere. Venice has many beautiful sights that people should take the time to visit – which of course, we did – but it also has many hidden gems, away from the tourists, off the packed streets and up the quiet alleyways where your own footsteps seem to loud. The best thing we did while in Venice was explore the side streets. I am not a great crowd follower – where there are too many people, there is also a very irritable me – We took the water taxis around Venice, got off at stops unknown and wandered around. The beautiful thing about ‘wandering’ in Venice is that it is impossible to get lost. 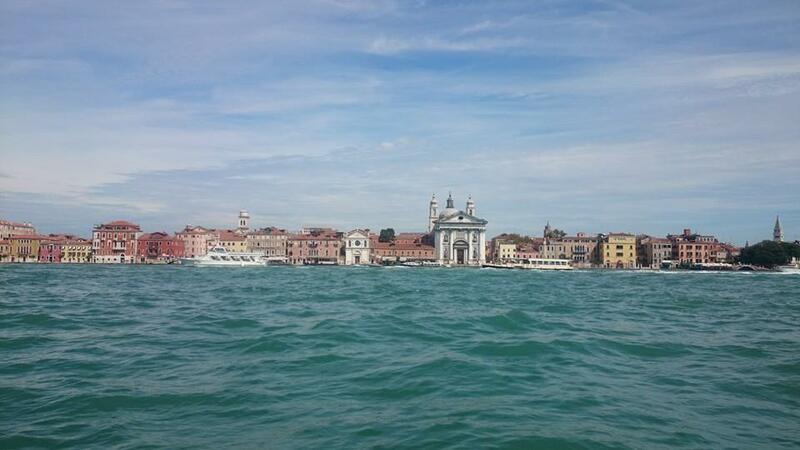 You will always reach a point of water, a water taxi port or a gondola pier. – So while you enjoy getting ‘lost’ up side streets away from the tourists you are never truly lost. We were in Venice in August/September and the main sights were packed with Tourists – I still don’t understand how Venice isn’t underwater by the sheer numbers of people on the islands – it didn’t discourage us from visiting the highlights that everyone wants to see in Venice. Stand in the middle of San Marco Square and take in three spectacular sights of Venice in one go – the pigeons don’t count, but make for great photo ops. 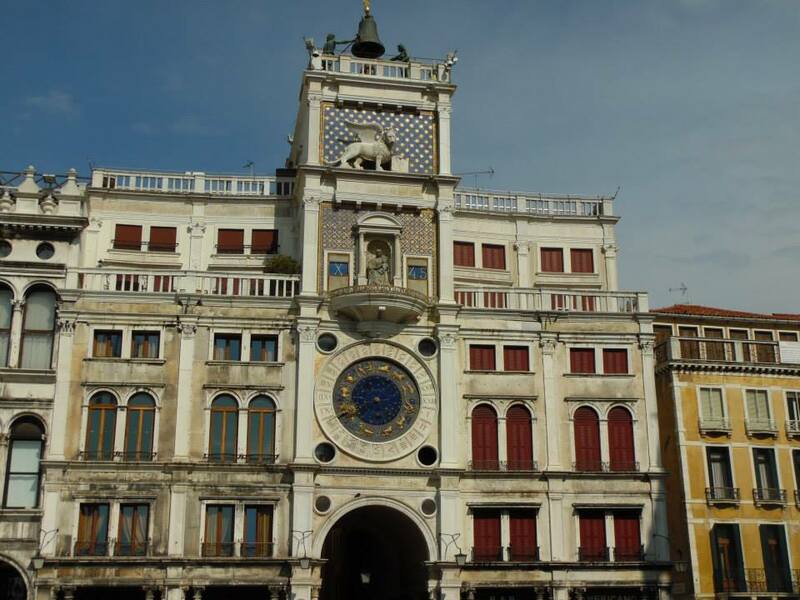 – St Marks Basilica, Doge’s Palace and Torre Dell’Orologio, a magnificent clock tower which totally enchanted me while we were there. The art work, the beauty, the precision and detail that went into these buildings are so beautiful, the crowds shouldn’t put you off and if you want to see the square with minimal people, why not try going at night? We are not early birds. So we wandered Venice in the Evening at times – yes, I know, two girls wandering streets at night is not a good idea, but I wasn’t going to miss Venice at night – and if you want to experience the sights without people, this is the time to do it. Tour the Canals on a Gondola in Venice is almost a must on the list of ‘things to do in Venice’. What they don’t tell you is just how much these ‘boat rides’ are going to cost you. This is an experience we sadly missed – I can’t lie, it is something we were both dying to before we got there – due to the sheer price of these rides – around €50 – €70 for a ride – it was something we couldn’t justify spending our money on, especially as water taxis were only a couple of Euros and basically (although, less romantic and slightly busier) did the same thing. Go into the local Artisan’s shops, watch them paint and ask them about their art. We found a tiny little Masquerade mask shop on one of the smaller islands we were exploring, we went in for a look and then came back the next day to make our purchases. The guys remembered us and we ended up buying one of the guy’s first mask he made and was able to sell – He was so thrilled he then took us into the back and showed us how the Masks were made and boasted about their work. Art is everywhere in Venice, on the banks of the Canals you will see Artists sitting painting scenery in among the tourists. Eat Pizza, Gelato and Drink with a view on the Riverbank. While Venice boasts beautiful buildings, Museums and art don’t forget to enjoy yourself a little. Sit on the bank of the river, drink coffee (which is so much better in Italy), Eat Gelato because you are in Italy after all! And the pizza slices are possible the best thing ever (Cliche, I know, but true). Leave the guidebook at home for Venice – make your own adventure – and get off the tourist trails. You will find cheaper restaurants with character and authenticity, tiny coffee shops and authentic shops selling more than ‘Tourist Tat’. The tourist sites are easy to find, like i said, it is almost impossible to get completely lost in Venice without coming across a dead-end with water first. This City is beautiful and was the best way to begin our fleeting love affair with Italy.. Exploring by night or even, early morning is so different! There is so many different personalities of a city that can only be seen at different times – and it’s nice to escape the crowds ha! I loved reading this, I was able to put myself completely in your shoes. Such a beautiful writer.